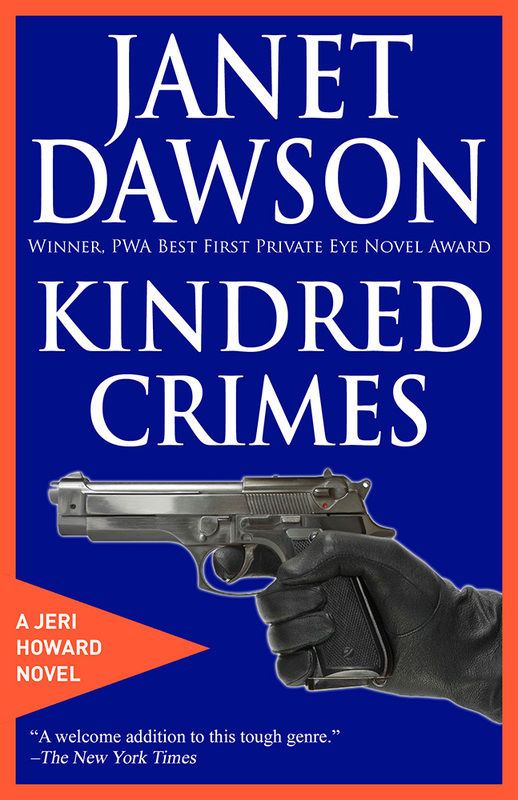 Jeri’s first case was Kindred Crimes, which won the St. Martin’s Press-Private Eye Writers of America Contest for Best First Private Eye Novel. The book was nominated for three awards in the Best First category: the Shamus, given by the Private Eye Writers of America; the Anthony, awarded at Bouchercon, the world mystery convention, and the Macavity, given by Mystery Readers International. In Kindred Crimes, Jeri is hired to look for a wife who has disappeared. What Jeri calls “a simple missing persons case” turns out to be complicated—and deadly. People aren’t who they seem, and the past comes back with a vengeance. Man, woman and child posed in front of a thick green Christmas tree, its branches laden with silver tinsel and gold balls. He stood behind her chair, hands resting lightly on her shoulders. Her blonde hair fell in waves past the collar of her red dress. In her lap she held a cherubic toddler. They smiled at the camera, the image of a perfect middle-class nuclear family, caught forever in a five-by-seven glossy. “When did she leave?” I asked. He was a slender fair-haired man of about thirty, well-dressed, with finely chiseled features. Now he put one hand to his pale face, as though to erase the lines etched by worry and strain. He sighed deeply. I waited for him to continue. He’d waited, an hour, then two, concern giving way to worry, plagued by visions of car accidents and abductions. Finally he called the police. They asked if Mrs. Foster left on her own. Of course she hadn’t, he said. Then he looked in the closet, the dresser drawers, the bathroom. Her suitcase was missing. So were clothes, shoes, the things a woman would take with her if she planned to be gone for awhile. The next day the bank called him about a bounced check. Mrs. Foster had emptied the joint account. I looked him in the eye for a long moment as I thought about this case and whether I should take it. Did Mr. Foster drink, take drugs, beat his wife or child? If that was the reason Mrs. Foster left, why didn’t she take the kid? And why did I feel that Philip Foster was holding something back?